Gourmet, world-inspired food for the budget-conscious, late-night, Chippewa Valley foodie. 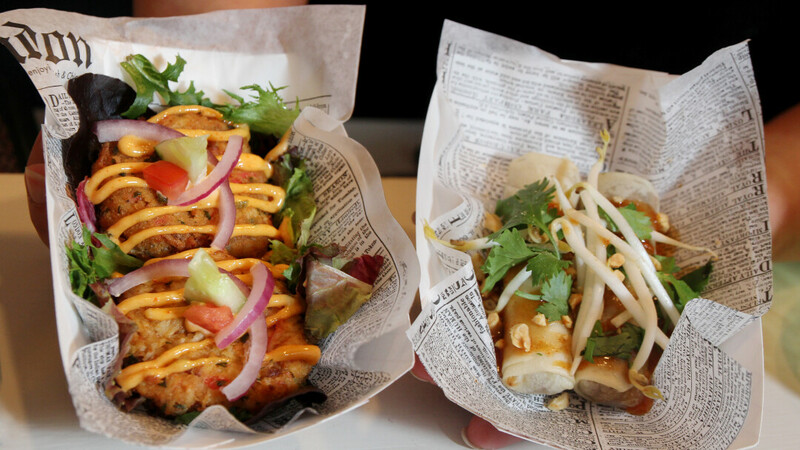 Featuring egg rolls, crêpes, crab cakes, flat breads, gourmet hot dogs, and more. Everything is made from scratch with original recipes. Open Thurs-Friday from 11:30am-1:30pm, 5pm-9pm, and late nights Fri-Sat from 10pm-bar close. This late-night, gourmet food eatery is also a great place to get craft cocktails during bar hours. Check out their ever-changing craft cocktails made with fresh ingredients, like the mojito, rosemary bourbon lemonade, peach tea and whiskey, and the Bellini float. Don't forget their seasonal and rotating menu of creative, world-inspired foods like chicken & waffles, crab cakes, crepes, egg rolls, gourmet hot dogs, apps and more. Open Thurs-Friday from 11:30am-1:30pm, 5pm-9pm, and late nights Fri-Sat from 10pm-bar close.